Windows Phone puzzle games are a great way to pass the time with. Find the right puzzle game and you may lose track of time. We've looked at puzzle games before in the Windows Phone Central Roundups and thought thought we'd take another glance at what's available in the Windows Phone Store. We've got a small collection of games that require you to solve the puzzles in a certain manner where you can move this way or that. However, one wrong move will end your chances at success and send you searching for the reset button. 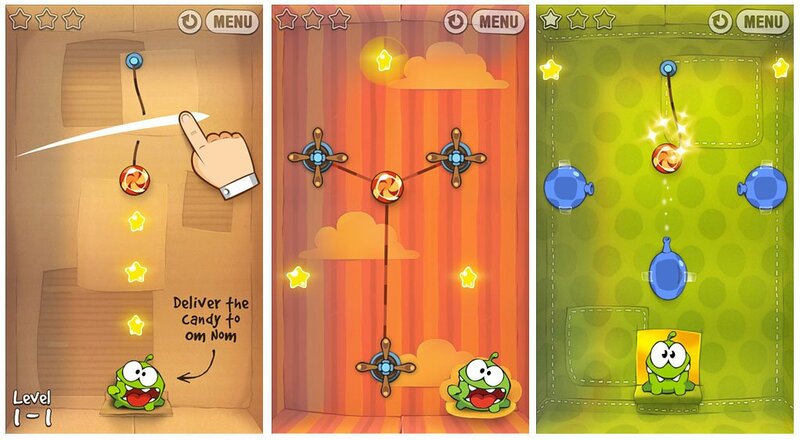 Cut The Rope ($.99): Cut the Rope is an Xbox Windows Phone game that has you cutting a series of ropes to drop a piece of candy to Om Nom, a hungry little monster. Sounds simple but if you cut the ropes in the wrong order, the piece of candy will never make it to Om Nom. Graphics are nice, game play challenging and addictive plus there's three hundred levels to keep Cut The Rope from growing stale. The downside to Cut The Rope is that there isn't a trial version available. The up side is that Cut The Rope is only $.99 and you can find it here at the Windows Phone Store. Shift 2 ($1.99): Shift 2 is an oldie but a goodie for your Windows Phone. Released in February of 2011, Shift 2 has you navigating a character through a series of mazes to escape an experimental lab. To be successful, at some point in making it through the puzzle you will have to flip the screen. The roof will become the floor. The floor the roof. Shift 2 has 145 challenging levels and has a bit of an addictive quality. It's a fun game that will keep you on your toes. Unfortunately, Shift 2 doesn't have a trial version and is currently running $1.99. You can find Shift 2 here at the Windows Phone Store. 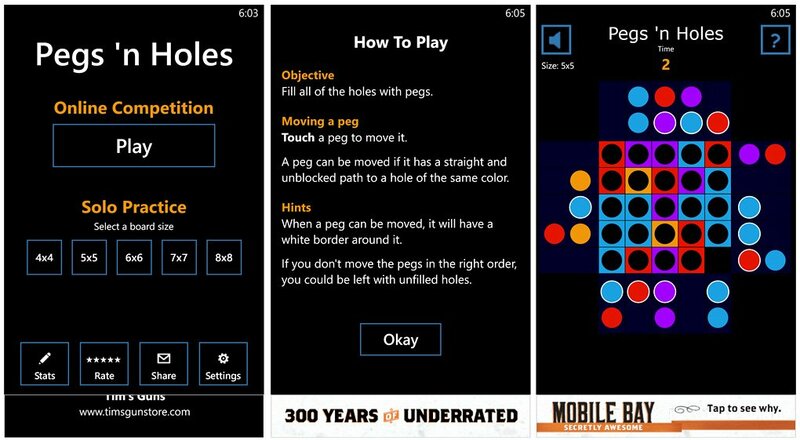 Pegs 'n Holes (free): Pegs 'n Holes is a fairly simple Windows Phone game but not without challenge. The game presents you with a series of colored squares, with holes in them, grouped in columns and rows. Scattered around the collection of squares is similarly colored pegs. You must match a peg with the same colored square within the same row or column to eliminate it from the board. There's a particular sequence to removing the squares and the goal is to remove them all. Pegs 'n Holes has an online competition to see who can solve the puzzle the quickest (free registration required) and five practice modes that involve various sized game boards. Simple graphics, simple game play, and challenging puzzles gives Pegs 'n Holes a decent amount of appeal. 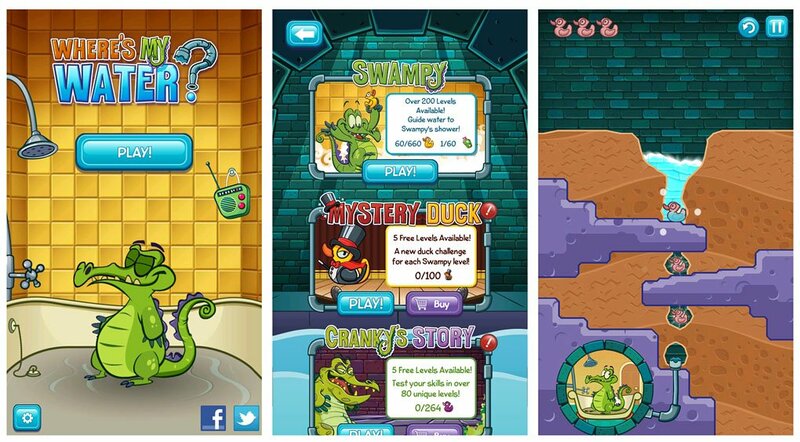 It's a free, ad-supported game and you can find Pegs 'n Holes here at the Windows Phone Store. Where's My Water? ($.99): Where's My Water? is a relatively new Windows Phone game from Disney. It is based off a Disney Channel character Swampy and it's your job to direct water to his shower. You basically dig trenches to direct the water flow through a maze of obstacles. To make things challenging you have underground fungus, some blue goo, and mechanical gates that will block you progress or contaminate the water. Where's My Water? has three story lines that contain over four hundred puzzles to master. It's a fun game for all ages but Where's My Water? lacks a trial version. Where's My Water? is currently running $.99 and you can find it here at the Windows Phone Store. 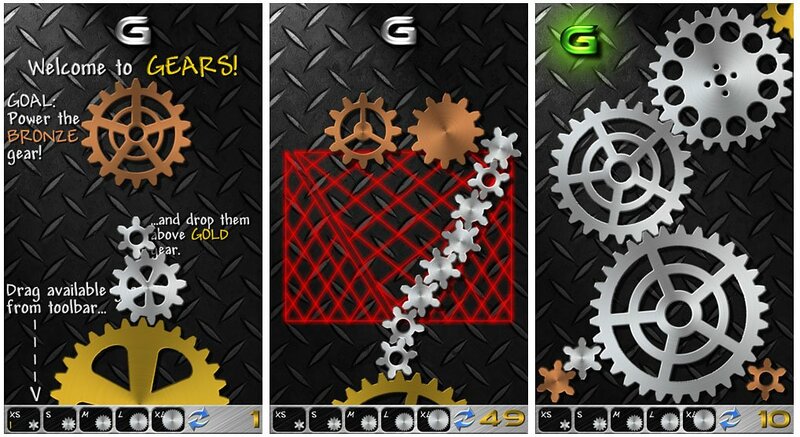 Gears (free/$.99): Gears is a puzzle game where you have to combine gears to complete a mechanical puzzle. You have a limited supple of gears to connect the power gear to the bronze colored gear. Gears range in size from extra small to extra large gears. Gravity does work with Gears, limiting the number of solutions to each puzzle. Gears has 100 levels of play that progressively become more challenging. There are two versions of Gears available in the Windows Phone Store. You have a free, ad-supported version that you can find here and a $.99 ad-free version of Gears that can be snatched up here. Puzzle games for your Windows Phone can help you pass just a few minutes or entertain you for as long as your battery will last. There are a healthier gaggle of these games in the Windows Phone Store and this is just a small sampling. If we've missed your favorite Windows Phone puzzle game, sound off in the comments and let us know what we missed.